Maggie* came in to me recently for private coaching because she was so frustrated with how hard she has tried for so long to be “perfect”. She is highly self aware, attractive and is very successful at work. Yet it seems that she cannot attract a man to save her life. When we looked a bit deeper, we discovered that she mostly navigates her life from her head up. She is very smart, rational and intellectualizes that if she could just change her ‘beliefs’ (another indicator of how she lives in her mind), then a good man would come in. I gently asked her if we could talk about her heart, which is how we enter into the feeling realm of our emotions and body sensations and shift out of the head, and how she felt about all of this mental strategizing on how to ‘get love’. I saw her eyes fill up with tears, a bit tentative at first and then she started sobbing. She recognized that she felt estranged from her heart. She knew she was a loving person, yet she struggled with feeling this on a daily basis. In fact, she had a hard time feeling in general. She typically thought about her feelings but seldom felt them. I probed a bit further, coaxing her to explore what was happening inside that brought on the tears so quickly, all the while recognizing that she needed to feel really safe with me as I could see that she was vulnerable. If a woman does not feel safe, her heart will close up as fast as can be. I asked her if she could remember the last time she really felt safe, soft, open and free in her heart. She realized it had been many years – with accumulated heartbreaks and disappointments in between – in fact, she wasn’t even sure if she ever really felt safe enough to fully open herself to another. Her heart had been behind a wall for as long as she could recall. She had been sexually abused as a young woman, so there was an understandable wall of protection that she had created as a method of coping with the loss of her innocence. By living in her mind, she was able to survive the pain that her younger self went through because the feelings were too much to handle at the time. For another woman, it could be the loss of a child that built the wall. Or a painful divorce created a fortress to guard her. I know for me, I was highly sexualized as a young girl and was raped as an adolescent. These early experiences left scars upon me that I often wondered if they would ever truly heal and it took me years to learn how to feel safe again. The reasons for building these walls around our hearts may differ from person to person, yet the shared commonality is that Maggie’s tender heart trusted in something or someone, and that was taken away. The pain of this loss then caused her to shut down her heart as a magnificent attempt to protect herself. The thing about masks is we can all see right through them, whether we consciously know it or not. We can feel when someone has a mask is on. These masks serve to protect the walls we have built around our hearts. Her energy communicated guardedness, self-protection and mistrust. This was the energy that kept her separate from the love she says she really wanted and effectively repelled men. No matter how well she dressed or how much she devoted to constructing her online profile – she was not available energetically or emotionally. And so at this intersection of her tears and with an acknowledgement of how disconnected she felt from herself, is where our coaching work took a deeper turn. Before we began softening her defenses and looking behind her masks, which attempted to hide the wall around her heart, we first had to develop a greater awareness of what truly helped her feel safe. It would be an error for anyone to attempt to dissolve the sophisticated layers of self-protection without first honoring the sacred role they serve and without first learning how to re-create a felt-sense of inner safety. I took her through the following excerpted exercise from Step 2 on The Journey of Extraordinary Love, which is a 12 week journey of healing and empowerment that I take women through. 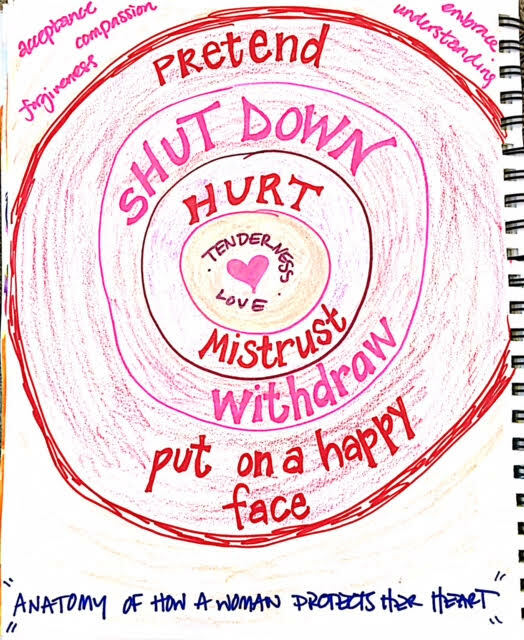 This exercise is designed to help a woman understand what is behind her need to shut down and protect her heart, as well as cultivate a more loving relationship with herself. First, we slowed everything down. It is common to rev up, talk faster, and to experience multiple reactions at once when we feel strong feelings. This is a way the mind keeps us separate from being present with our feelings. By slowing down to acknowledge what we are feeling, we make space for grace to enter. Grace is a healing presence that helps us to resolve pain and when we pause, we make ourselves more available for this. I asked her to acknowledge what was present in her mind (thoughts), the feelings in her heart (emotions) and then the feelings in her belly (instinct). We uncovered that she felt angry, sad and powerless and thought that she shouldn’t be feeling this way. The next step in this powerful practice is to make it all okay. No matter what she was feeling, whether it made sense or not, we welcomed it. We accepted it. We honored it as guest who had a valuable message to share and imagined wrapping our arms around the parts of her that were mad, sad and had a hard time giving her permission to be where she was at without judging herself. We started by her practicing accepting that it was hard for her to accept her feelings at times. Lastly, we asked he one inside of her that was mad and sad, what did she need? There is always a message in self-protection and when we give ourselves permission to slow down and ask, you may be surprised what wisdom is revealed when we pay attention to our deeper self. When she asked the wall around her heart what it needed, she learned that that she needed to cry her tears. She also needed to have stronger boundaries and that she needed to communicate this more honestly with men. Don’t be fooled how simple this process may sound, It is quite powerful to give ourselves the space to name what we are feeling and to let ourselves be seen and heard. We call upon our soul gifts to be our guides. We look for the feelings of sadness or loss, the past events that were too painful at that time to fully process and we do our best to enlarge our hearts around the ways we each have silently suffered. By accessing the wisdom of our heart, by paying attention to what we are feeling and needing, we uncover an incredible governing system that guides us to our inherent strength and our greatest source of power. Your loving is enough. Your loving will heal you. By finding a sacred witness in the form of a trusted coach or therapist to guide you through the process of self-discovery and healing, I have found that all things are possible. Love this post? Please forward to a friend or share on your social media channel. I’d be so happy if you joined my Facebook group Extraordinary Love – a welcoming place to learn and grow together where I hold live coaching hours and share keys for your transformation.